Like a lot of Ubisoft games recently, Assassin’s Creed Odyssey has a lot of versions available to buy, perhaps too many editions. Most will probably just opt for the standard edition and be done with it. However, for those curious enough about each and every edition, the following guide will go over what each version contains, including the physical versions of the game and the contents of any pack within. Once you’ve decided which version of Assassin’s Creed Odyssey you want, if you’re looking for more advice on the basics of Assassin’s Creed Odyssey, then head over to our Assassin's Creed Odyssey guide for more information to get you up to speed. What does each edition of Assassin’s Creed Odyssey contain? Kronos pack – contains the full Armour of Kronos armour set, the Hourglass mount, and the spear “Harvester of Time”. Herald of Dusk pack – contains the full Herald of Dusk set of armour, and the Dusk Blood Offering sword. Capricornus Naval Pack – contains the Capricornus boat and sailor skins. Temporary boosts to XP and money. 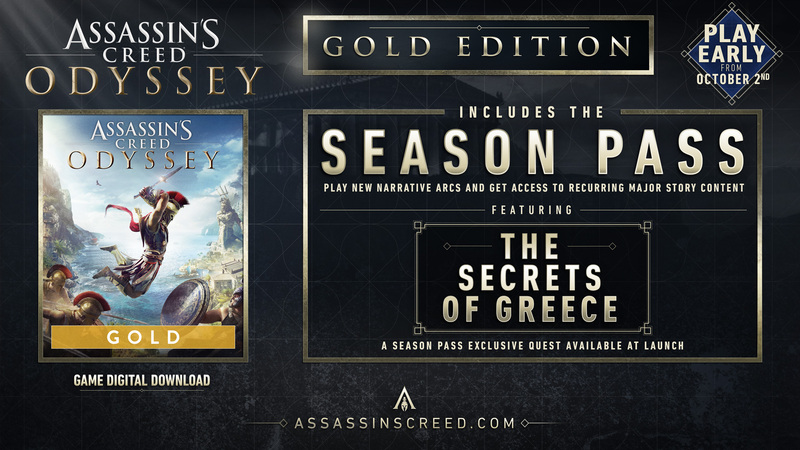 The Gold edition contains, in addition to the game itself, a quest called “The Secrets of Greece”, which can be played from launch, as well as the upcoming Season Pass for the game. 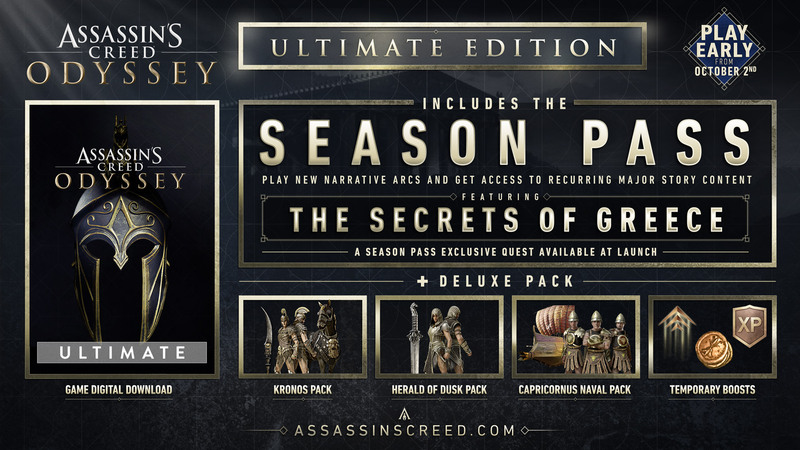 The Ultimate edition on the other hand combines both the content found in the Gold and Digital Deluxe editions into one bundle. These three bundles are all available digitally and see hefty price hikes for each version. Then there are the more bulked out versions of Assassin’s Creed Odyssey that are only available in physical form. 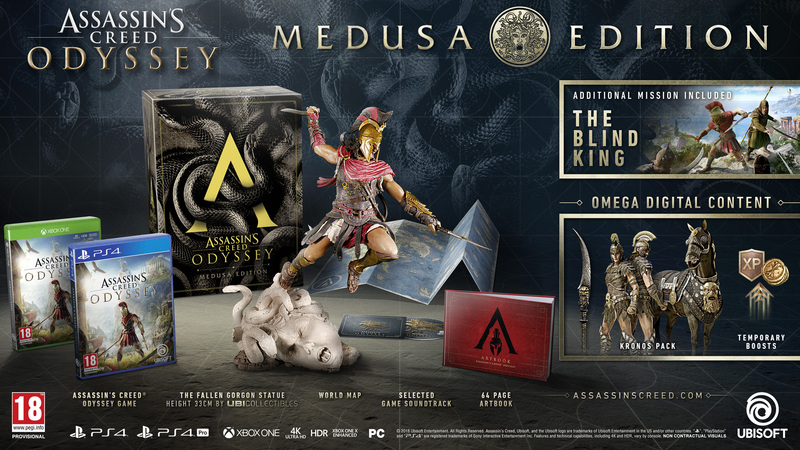 The Medusa edition contains the game, a “Fallen Gorgon” figurine, the world map, a 64-page artbook, a premium collector’s box, and selected music from the game’s soundtrack. 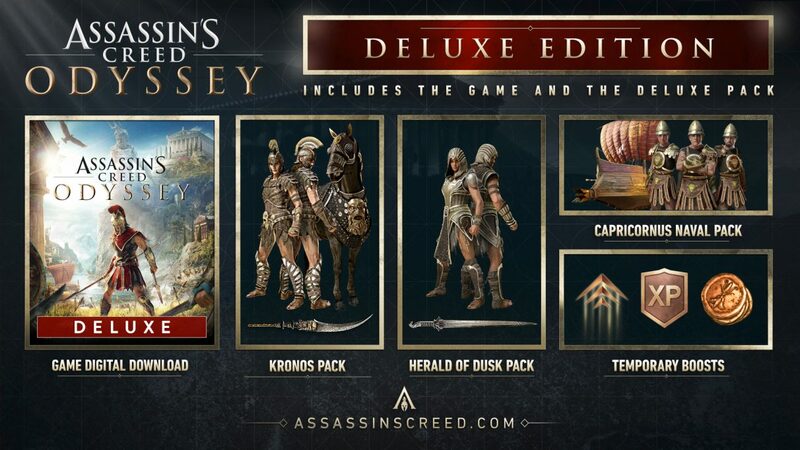 It also features a set of missions called “The Blind King” which you can read up on in our Assassin's Creed Odyssey The Blind King guide, as well as the Omega Digital Content pack that includes the Kronos pack as detailed above, as well as some temporary boosts. The final two editions are Ubisoft store exclusive purchases. 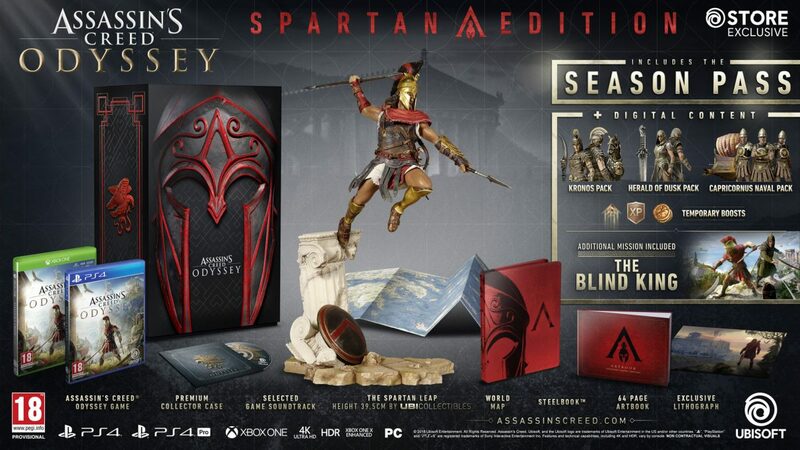 Spartan edition on the other hand includes everything you can find in the Medusa edition, only it replaces the Fallen Gorgon figurine with a “Spartan Leap” figurine, and expands the digital goodies to include the rest of the content found in the Digital Deluxe edition and includes the season pass. 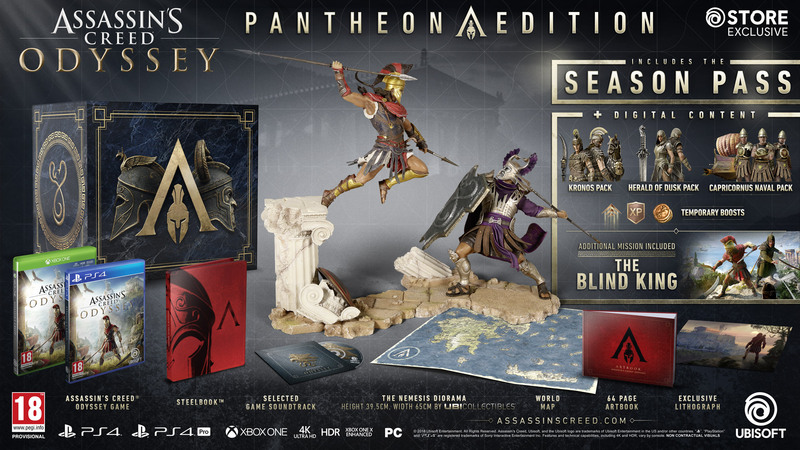 Finally, the Pantheon edition copies the Spartan edition, except for the statue which is replaced with the “Nemesis Diorama” figurine. Now that you’ve decided which version to buy, which is likely going to be the standard edition if at all, you’re probably wondering what you can do in the game. You can check our extensive Assassin's Creed Odyssey side quests guide for more on the huge number of side quests, or take on the various beasts that Artemis set loose, as detailed in our Assassin's Creed Odyssey Daughters of Artemis guide.